There are 7 search types you can set namely: Exact-content duplicate file, Same-name duplicate files, Large duplicate files, Large files ,Zero-size files, All files and Custom . Same-name files are suspected to be the same but their contents may be different. Duplicate files are those contents identically the same regardless file name. File A is exactly identical to file B. Those files with the same file name but may different in content. Note: Make sure these file are identical before deletion. 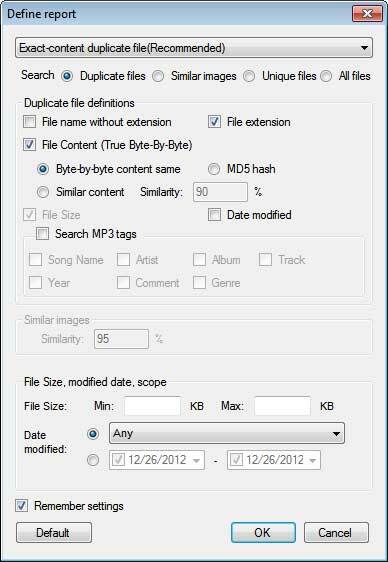 Searching MP3 with same Title and artist in MP3 tag. Note: You can included other information like album, track No. by checking corresponding boxes. File sized more than 1 MB and having same file size are compared among each other in terms of their content. Those files without any contents. They are usually temporary files. This option allows user to search for all files in the in the path specified. This option allows user to make custom filtering setting. The combination can be varies such as same name but not same size , same content but not same name. Note: Check the box [Remember Settings] if you want to keep your changes. Check this to include hidden folders and files in the search. Note when this is not checked, if files which are not hidden but located in a hidden folder, they will be not be included in the search. Exclude Windows folder and Program files folder in the search. It is highly recommended to check this box.